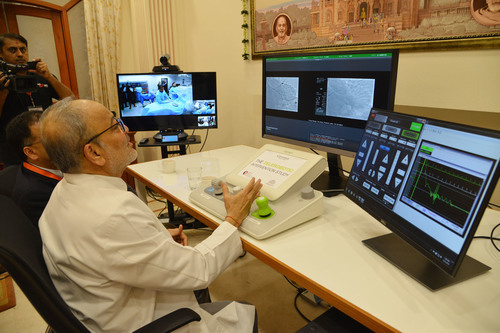 Telerobotic coronary interventional platform has the potential to dramatically improve patient access for both elective and emergent percutaneous coronary interventions and stroke in rural and underserved populations - as well as reducing time to treat emergent procedures such as STEMI and stroke and will also reduce variability in operator skills and thus, improve clinical outcomes. As a world first - the possibilities are endless. Chief Minister of Gujarat Shri Vijaybhai Rupani, Deputy Chief Minister Shri Nitinbhai Patel along with saints of Bochasanwasi Akshar Purushottam Swaminarayan Sanstha (BAPS) Pujya Shri Brahmavihari Swami and Pujya Shri Ishwarcharan Swami were all present for the procedure. The event was preceded by a small spiritual ceremony of Neelkanth Varni Abhishek and universal prayers for peace and progress. Corindus Vascular Robotics, Inc. is a global technology leader in robotic-assisted vascular interventions. The company's CorPath® System is the first FDA-cleared medical device to bring robotic precision to percutaneous coronary and vascular procedures. During the procedure, the interventional cardiologist sits at a radiation-shielded workstation to advance guide catheters, stents, and guidewires with millimeter-by-millimeter precision. The workstation allows the physician greater control and the freedom from wearing heavy lead protective equipment that causes musculoskeletal injuries. CorPath GRX is the second generation robotic-assisted technology offering enhancements to the platform by adding important key upgrades that increase precision, improve workflow, and extend the capabilities and range of procedures that can be performed robotically. With the CorPath System, Corindus Vascular Robotics brings robotic precision to interventional procedures to help optimize clinical outcomes and minimize the costs associated with complications of improper stent placement during manual procedures. For additional information, visit www.corindus.com and follow @CorindusInc. This press release was distributed by ResponseSource Press Release Wire on behalf of Marvellous PR in the following categories: Health, Medical & Pharmaceutical, Manufacturing, Engineering & Energy, for more information visit https://pressreleasewire.responsesource.com/about. Dr Patel performing the procedure.